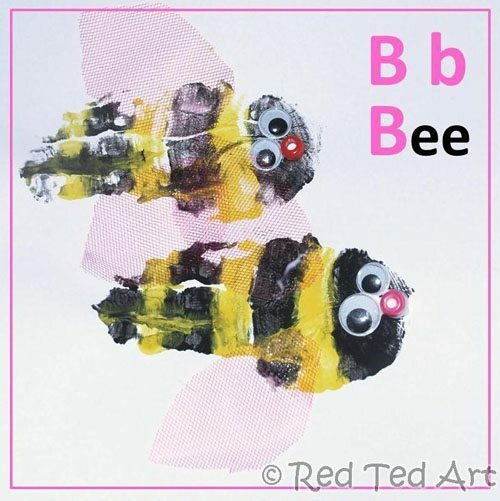 Hello, I’m Maggy from over at Red Ted Art where I regularly get crafty with my two preschool age children – Red Ted (4yrs) and Pip Squeak (2yrs). As Red Ted has been learning all about the alphabet at his preschool nursery, I thought it would be fun and nice for him if we did some crafty activity to support him and his learning at home. Both my children ADORE painting and both LOVE, LOVE, LOVE to get messy. Although I am very much pro crafts, I don’t really paint as much with them as I could. So, I decided that it would be great if we did a handprint alphabet series. So off we embarked. I confess… I didn’t really know where our journey was going to take us and just thought I would do one handprint craft at a time. 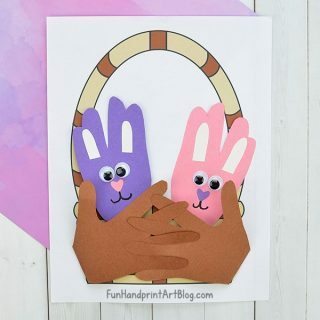 Though very much directed by me (handprint crafts by definition are very adult led), I try and give the children as much free reign as possible. See the handprint bee? Well.. I had envisaged a completely different bee, with the wings more at the top and only one eye in profile. Red Ted decided to place the wings on top and bottom and add two eyes (giving it more of an aerial view)… and the “nose” was his idea too. I adore it. Each week Red Ted gets to choose what we will make next. We talk about the letter and what things start with that letter. It quickly emerged that we were doing an ANIMAL handprint alphabet. That wasn’t the plan (there was no plan), but Red Ted LOVES the animals and is quite clear that we should ONLY do animals. I usually present 2-3 ideas for him and he chooses… then we get crafty! 3) “An embellishment” – such as funky foam, card, pen, etc. We always do it together – Red Ted, Pip Squeak and I – and I love seeing how different the pictures turn out for the 4yrs old and the 2yrs old. Without a shadow of a doubt they put their own personal stamps on them. If I feel the children didn’t have enough “own creativity”, we usually end the session with some free painting – using up the leftover paint with brushes, sponges or, ahem, just our hands! A great way to explore paint and colours and how things mix! Now that we are half way through the alphabet, I love how the children sit there discussing our next letter and how you could use the hand and the different fingers to create their pictures. For example – we did a Penguin and Red Ted said he wanted the thumb and the little finger to stand away from the rest of the fingers to make “the penguin’s wings”. Or how he “made” me do a “Footprint Giraffe” at father’s day! (In fact, he has already asked whether we will be doing a footprint alphabet once the hands are finished… hmmm, not sure yet!). I have not once had them say “no”, when I have asked whether they would like to do more alphabet handprints and am greeted with a joyous “Yes”. If the animal is unusual (e.g. the Narwhal), we look it up first online and check out the key distinguishing feature and then make up our handprint animal! It is a great way for us to learn about new animals, what they look like and where they live! 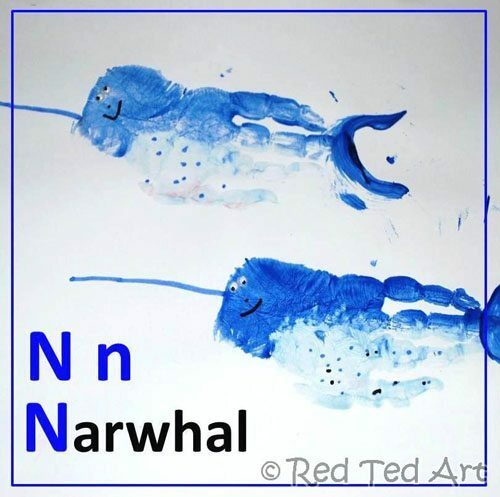 Although my posts don’t include this, we usually practice writing the animal name too – Red Ted has surprised me with his enthusiasm to write. I don’t “push” this side of the craft though, as I really want him to enjoy writing and never feel it is a chore. Most letters we have 4 copies – 2 that Red Ted made 2 of Pip Squeaks. And we have a set displayed in our Family Room and in Red Ted’s bedroom. Wonderful to see the collection grow and have the alphabet on display! Readers have suggested that they will use the alphabet to write their own names in handprints!! What a lovely idea! You can find the whole Alphabet Handprint set to date. It will be completed in due course! I do hope you feel inspired and have a go yourself! We have enjoyed the process so much to date!!! 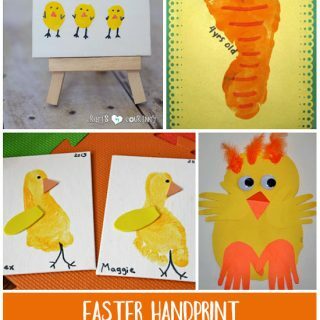 Maggy Woodley writes at Red Ted Art, where she shares weekly “Kids Crafts” as well as weekly “How Tos” for adults and teens. 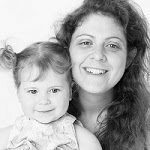 Recently she has added a “Daily Creativity” series, which shows simple day to day activities that helps nurture the artist within a child, in conjunction with exploring great artists and “getting arty” with her children. Thanks again for the awesome guest post Maggy!! !